The Ministry of Defence earmarked land at Larkhill, less than one kilometre north-west of Durrington Walls and three kilometres north-east of Stonehenge, for new housing as part of the Army Basing Programme. Defence Infrastructure Organisation and its consultants WYG employed Wessex Archaeology to investigate the archaeological potential of the area - previously thought to be free of significant archaeological remains - before building work began. Among a wealth of archaeology, the evaluation trenching revealed a Wessex Linear and other ditches which were considered to be parts of later Bronze Age and Iron Age field systems; an undated unaccompanied inhumation burial; a sub-rectangular Iron Age enclosure; lynchets and terraces of probable Romano-British date; and military remains. Image captured by Rob Rawcliffe of FIDES Flare Media Ltd. These results were of sufficient interest and in an area of sufficient archaeological sensitivity for Wiltshire Council Archaeology Service to require full excavation of the area. Stripping commenced in July 2016. Excavation revealed an Early Neolithic causewayed enclosure, Beaker inhumation burials, a Middle Bronze Age cremation cemetery, a very small ring-ditch, and the extensive remains of military practice trench systems, mainly from World War I. The most notable prehistoric discovery at Larkhill was an Early Neolithic Causewayed Enclosure approximately 210 metres in diameter. A series of seven ditch segments against the site’s southern boundary formed 117 metres of the enclosure’s arc. Original image captured by Rob Rawcliffe of FIDES Flare Media Ltd. The two easternmost ditch segments were separated by an unusually wide causeway of 13.5 metres, which may have been an entrance. Placed centrally within this gap was a shallow oval stepped pit containing Early Neolithic pottery. Other ditch segments contained pottery of various types. 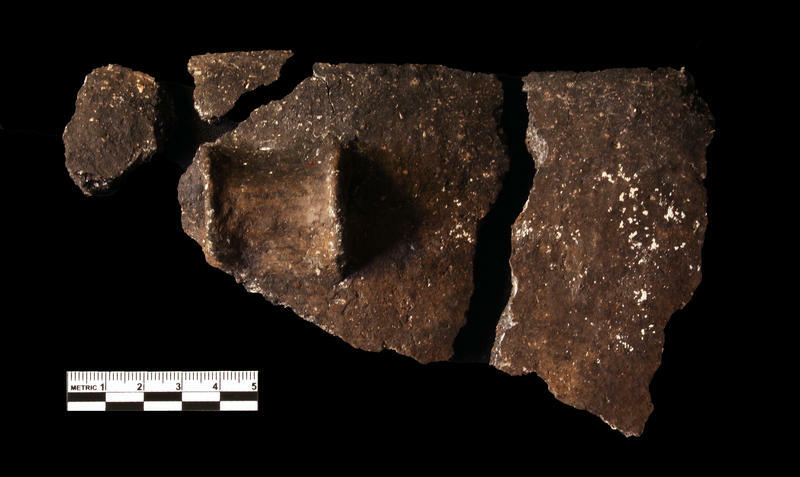 The primary fills contained fragments of Decorated Bowl pottery, most of which were of a stylistically local type (Windmill Hill ware), but which also included forms that were more typical of the south-west peninsula (Hembury ware). Only a single line of ditch segments was encountered. Since many Causewayed Enclosures consist of multiple circuits of ditch one inside the other, further arcs may exist inside the area defined by the excavated segments (there are none outside it, on the north side at least). The projected diameter (210 meters) compares well with that of the well-known Causewayed Enclosure at Robin Hood’s Ball, four kilometres to the west-north-west, perhaps suggesting that an inner ditch circuit could be expected. The enclosure and its associated features represent a major new discovery in the Stonehenge landscape. It sits just below the brow of the low hill occupied by Larkhill Camp, commanding broad views to the north-east across the valley of the river Avon towards Barrow Clump and Sidbury. While most of the enclosure remains uninvestigated within the camp, projections of its size suggest that its entire circuit lies on the northern side of the hill, and therefore looks out across the Avon valley rather than south and south-west towards Stonehenge, adding a very significant architectural element to the Early Neolithic landscape north of the WHS. Excavations at Larkhill revealed a large array of WWI practise trenches. This complex of trenches and tunnels is where British and Commonwealth soldiers were trained in advance of their mobilisation to the theatre of war and was in use from 1915 to 1918. The area was later used to train forces in advance of WWII and even into the 1970s. In the process of excavation, archaeologists have identified graffiti left by some of the soldiers and have identified records of the presence of others through archived documents. Soldiers from all over Britain wrote on the chalk as well as a significant number of Australians. They left signatures and details which have allowed us to identify some of the soldiers, research some of their stories, and on some occasions – contact their descendants. Most exciting was the discovery of a chalk plaque inscribed with the names of Australian Bombers − soldiers specially trained to use hand grenades to attack and clear German trenches. One of the names is of Private Lawrence Carthage Weathers, who won the Victoria Cross in September 1918 for attacking a German machine gun post with grenades, capturing guns and taking 180 prisoners. Under the guidance of our client (Martin Brown of WYG) we have recovered many finds from the trenches which provide a fascinating insight into life on the base. The diet of the soldiers included tinned sardines and corned beef, jam, marmalade and golden syrup, condensed milk, Bovril and meat paste, with condiments such as HP Sauce and Worcestershire Sauce to make things more palatable. 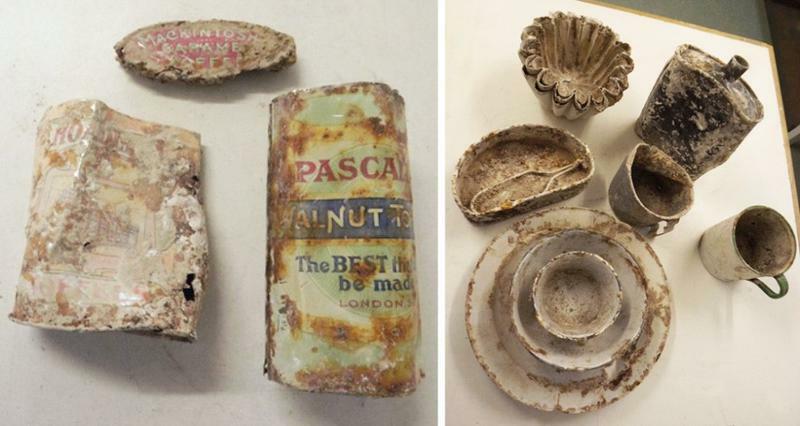 Many examples of the standard-issue eating and drinking equipment have been found – plates, bowls and cups in enameled tin or plain white pottery, mess tins and drinking canteens, plus the occasional surprise item such as a nest of jelly moulds. 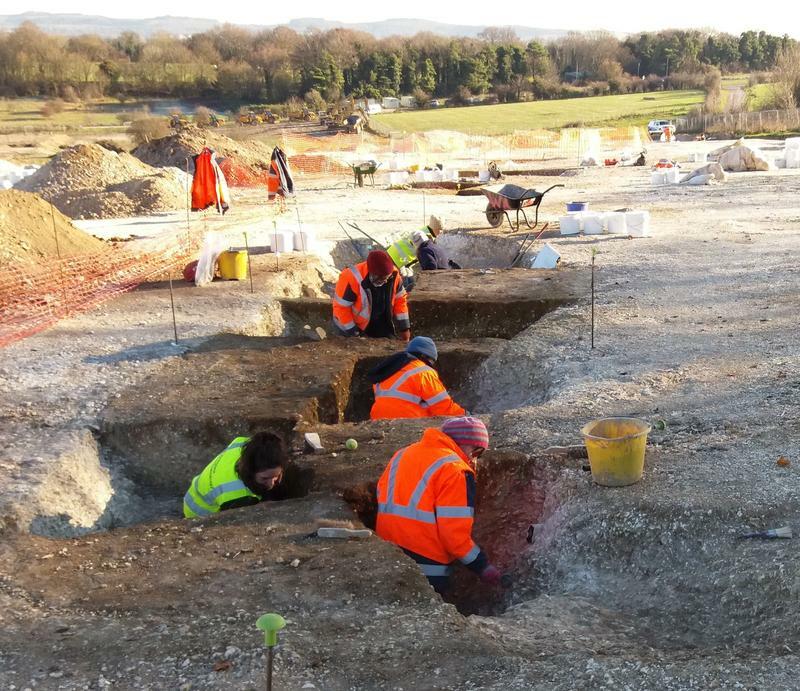 As a part of the preparations for the building of service family accommodation for the Army Basing Programme on Salisbury Plain, Wessex Archaeology has been carrying out archaeological investigations for over a year at Larkhill. During this work a large array of WWI practice trenches came to light. In preparation for building Service Family Accommodation at Larkhill, Wessex Archaeology has identified and excavated a large array of WWI practise trenches. This complex of trenches is where British and Commonwealth soldiers were trained in advance of their mobilisation to the theatre of war and was in use from 1915 to 1918. The area was later used to train forces in advance of WWII and even into the 1970s. Two weeks ago we talked about the compelling history of our Larkhill site with its practice trenches, tunnels and personal stories of the men that trained there. This week we want to share an example of the names written onto the walls of tunnels by and British soldiers trained at Larkhill. Archaeologists working in Wiltshire have identified a unique network of First World War tunnels under Salisbury Plain at Larkhill. The tunnels are part of a First World War battlefield used to train men to fight in and under the trenches of France and Belgium. Within a WWII artillery position at Larkhill, we found the remains of an MG car, not an everyday find on an archaeological site! Because of the unusual nature of the find we felt that it needed to be recorded in some detail, but standard photography and a plan really wouldn’t have done it justice. Instead, we decided to record the car in 3D using photogrammetry.